Magnetek furnishes a variety of cable specifically designed for festoon applications. 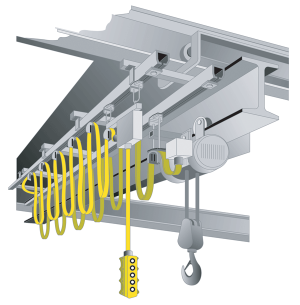 The cable is available in a round or flat design and comes standard in a safety yellow color. 105° C (221° F) 600 volt A.C., 250 volt D.C.
* Special cables are also available-contact the factory for more information. ** Magnetek’s flat cable is rated -40°C to 105°C. Round cable is rated -10°C to 90°C. However, they are not recommended for severe flexing or impact at temperatures below -10° C. For severe flexing applications below -10° C, contact the factory for more information.